As more idaho athletes make their way to the national platform, what are some key issues that coaches and athletes need to consider? Michael Conroy: To begin I would like to acknowledge the Idaho BOD for their efforts in administering the very first two platform event at the 2018 State Championships this past October. Their organizational skills in having this event run just as any “National Championships” only serves the membership of our LWC in preparing them for their time at a national competition. Both the quality and the quantity of national level athletes was at the highest level in the history of our LWC. As more Idaho athletes find their way to the national platform it is important that both coaches and athletes understand the USA Weightlifting policies, procedures and ethical considerations for both Athlete Production and Coaching Advancement. In my 6 year tenure as the Director of Coaching Education for USAW no other issue took center stage more than which coach gets credit for what athlete performance and what are the ramifications when athletes change coaches and or clubs. Athlete Production: *Athlete must currently show the Coach Candidate as the Coach #1 on the Membership Profile at the time of the achievement and time of application. Additionally, the Coach Candidate must be listed as the Event Coach and be physically present in the Field of Play during the athletes session. Alternatively, the athlete at their exclusive discretion may submit testimony to the effect that the coach was the Coach #1 at the time of the achievement in the case of an International and Snr International only. Stipulations: - Only one coach may advance on any one athlete, unless the total of the athlete increases more than 10% under the new coach, OR the athlete moves up a competition level under the new coach (for example, an athlete moves from only appearing in Nationals to World Championships level, or from World Championships level to Olympic Games level), where the athlete also increases their total by at least 5%. All total increases verified via Webpoint and/or IWF database as appropriate. What are athlete’s rights and expected responsibilities regarding club membership and coaches? 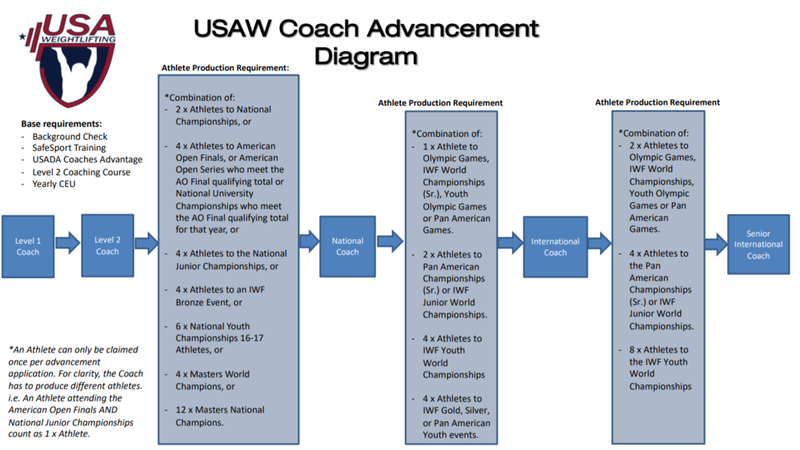 Michael Conroy: An Athlete has the right to list any USAW Coach as their Coach 1 as long as that Coach agrees to take the athlete into their stewardship. An athlete may only be the member of 1 club at a time. Common courtesy assumes that an athlete will inform a coach if they are delisting them or changing coaches but this is not a requirement. It is an ethics violation for a USAW Coach to approach an athlete who is a member of a registered club and or has a listed Coach 1 in their membership account with the intent of recruiting that athlete for their services or club. Additionally it is an ethics violation for an athlete, who is a member of a USAW registered club or has an individual listed as their Coach 1 in their membership account, to approach a coach with the intent to offer their services (self-serving, self-dealing) in exchange for changing clubs. An Athlete may change their coach or their club by accessing their membership account and make that change of coach or activate the Change of Club request. If the administrator of the current club approves the request the athlete my join and represent the new club immediately. If the current club denies the request the athlete must select unattached status for a period of 4 months. (An athlete may list themselves as unattached at any time of their choosing). They may begin working with their “new” coach immediately but may not represent the “new” coaches club for the 4 month period and the above policies concerning the “new” coach receiving credit for the athlete are active. By being proactive on this issue our LWC can avoid the loss of time, confusion and frustration both at the local and national level resolving coach/athlete matters. The mission statement of the USAW Community Development Site is to be USAW’s national presence at the local level. If this article has created more questions than it solved just get with me at usaw@crownperformance.net and I’ll be happy to call you and answer your concerns. For those coaches that had athletes compete in the American Open Finals or National Juniors please contact me for the additional steps you’ll need to complete so that you’ll receive credit for your athletes performance if you feel you need some assistance in navigating these requirements.